I recently moved and am now in the middle of fitting the kitchen. We decided for a hardwood worktop (birch, maybe not that hard...) to match the kitchen. I was lucky to find a slightly used APS900 on eBay to help me justify the purchase. There were some dings and cuts in the guiding part, which I was able to completely fill and smooth out again with liquid aluminium. Now to my concern, since I cut all the worktops in different depths to accommodate for the varying circumstances of walls, plumbing etc. I am a little concerned about alignment of the joints. Do I need to make sure that the worktops are an exact match in depth for the referencing? Or is there some „wiggle room“ once the connectors are in? I will use Dominoes for alignment, one mortise tight, the other one a bit wider on the DF500. 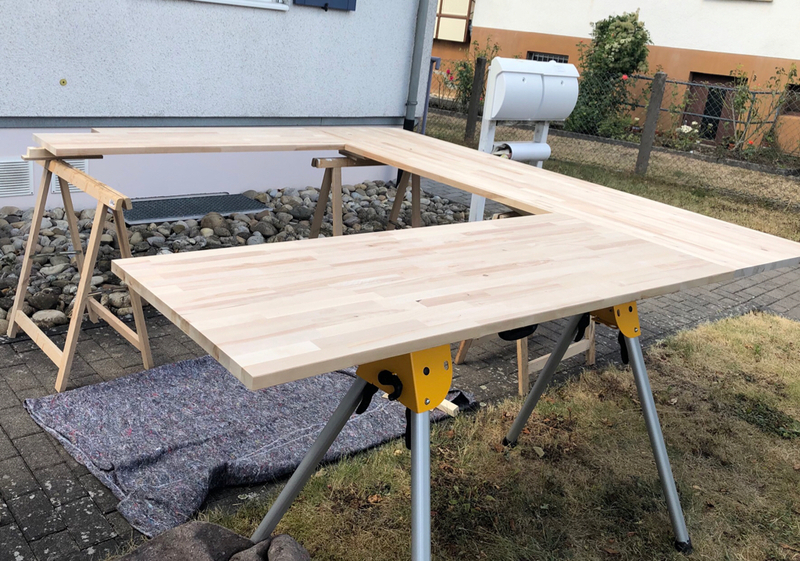 My plan for finishing is to get the whole worktop out of the kitchen, assemble everything on sawhorses, sand in assembled state, then oil. How would you do the roundover/chamfer? Assembled in one piece or everything separately? Thank you all for any input! 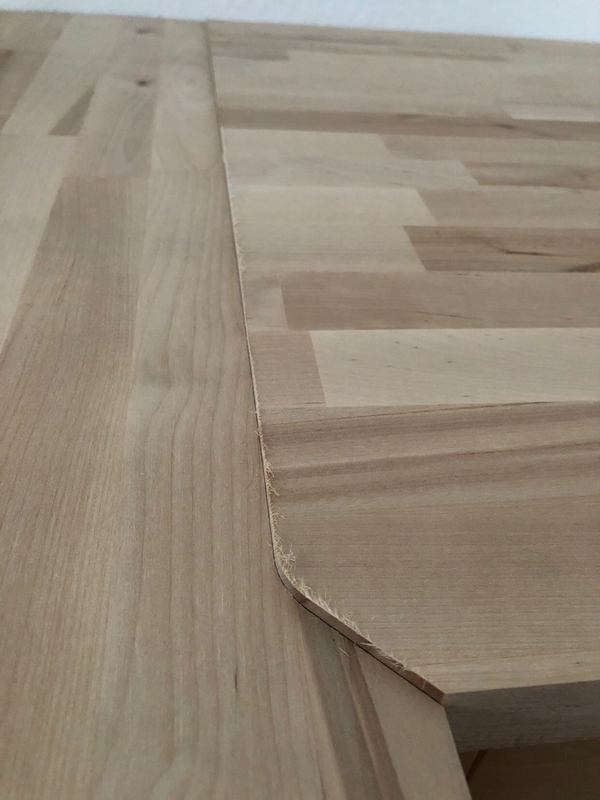 Use it to mark the male by placing the worktop on top, parallel, using an off cut to support the other end and also carefully mark where the front joint needs to begin. Place the jig at the router cutter offset from the scribe and from the front joint point - cut from the underside so I cut into the front edge and no tear out. Glue up in place using bolts inset underneath but no dominoes or biscuits. The bolts provide the clamping force and the glue provides the strength and waterproofs the joint. Use a block and hammer or rubber hammer to finesse levels as the bolts are progressively tightened and a wedge or chisel at the wall to force the front inset part of the joint tight. Avoid over cleaning the glue line so no water entry point is created. Usual rules re round over - do any end grain machining first and take account of what you can and can’t access with your chosen tools once the corner is glued. Rooms aren’t square and walls aren’t flat. Don’t try to move a glued up worktop set into place later....there be dragons. Think through the build sequence - eg if your worktop butts up to a high gloss panel or is trapped in an L shape etc. Have a practice run first too....using something cheap that machines well eg 25mm mdf. Also you need a good quality sharp half inch cutter and make lots of passes at about 5mm using the rear edge of the guide then one final full depth pass using the forward edge of the guide to take off the steps and leave a perfect glue edge. I‘m quite happy with how the joints turned out. I was mainly worried about alignment, for the final fixing. But your comments in regards to hammering/final fitting in place, keep me optimistic. The kitchen will be U-shaped in final configuration. One of the sides 650mm deep, the other 43mm deep. Head piece is 710mm to accommodate for plumbing in front of the wall. Leveling still needs to happen, but general alignment is quite pleasing. I got a 14mm ENT cutter that does the task without complaining. I follow the Festool instructions for direction of routing. 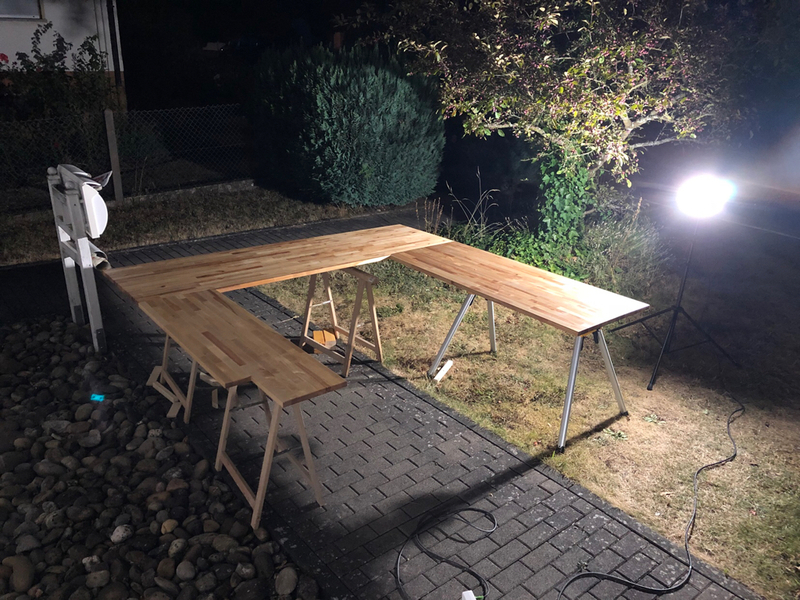 Do you use waterproof wood glue? Or would something that dries more brittle be better? Definitely waterproof. Titebond III for me. I don’t rely on someone carefully re-oiling the joint area and wet wood goes black. 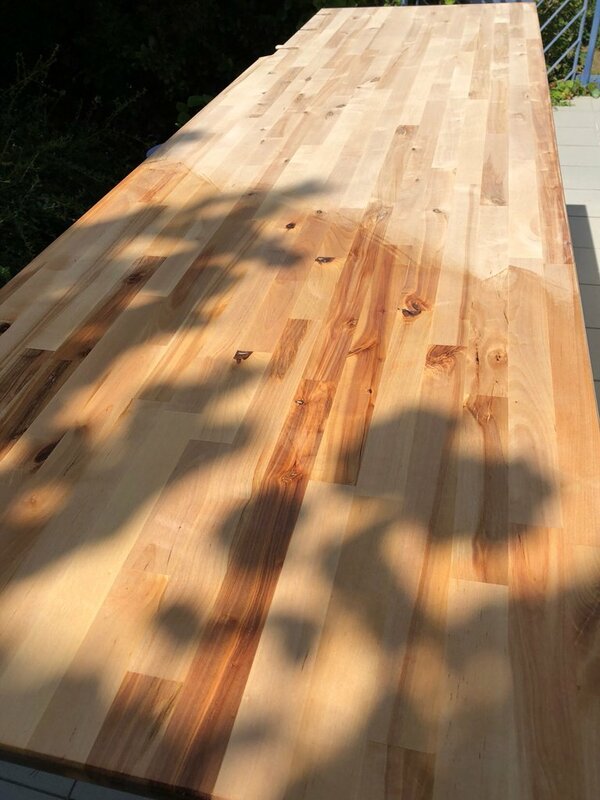 I built a maple counter top and used Titebond III, it's been in place for 5 or 6 years now, gets multiple wipe downs daily. No problems with the glue joints. It's a cutting board/prep surface, so the only finish we use on it is bee's wax. And I‘ve been quite happy with the Surfix HD on a couple of living room tables. So. Joints fit quite nicely! Thank you guys again for your tips. Everything seems to go quite well. First coat of Surfix is done. It got a bit late, but who does not like using another Festool to get the work done. Finally everything it ready and finished, but the kitchen sink is nowhere near, so final fixed install will still be a while. To me, wood is just the gift that keeps on giving. I tremendously enjoy working with it, and when I’m done, I enjoy looking at it the same.